Pacemakers are medical devices designed to help the heart beat in a normal rhythm. In a normal heart the rhythm is determined by electrical impulses triggered by the sino atrial node, found in the right atrium of the heart. When this signal becomes defective an artificial device is needed in order to keep the heart beating in a healthy and effective rhythm. There are many different types of pacemakers, designed for individual needs of the patient. In general they can be either permanent or temporary and some work continuously, others on an ad hoc basis, as these contain a sensor and only work if the heart’s natural rhythm changes into a pattern that is not sufficient for the patient, such as a drop in regularity or change in pattern. It will take over the beat until the heart has corrected itself. 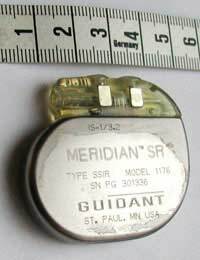 Pacemakers are essentially computer based, battery operated devices that are implanted into the tissues of the patient. Once the device has been implanted, tiny wires are directed to the heart using x-ray technology. They are relatively small in comparison to original designs and will be programmed according to the patient’s needs. Most people requiring the use of a pacemaker will need it because of an irregular heart rate. Usually this irregularity causes the heartbeat to slow or sometimes even stop, the pacemaker will prevent this occurring and keep the heart in a healthy rhythm. Unlike original pacemakers, modern devices can now be implanted under local anaesthetic and may take up to two hours to implant. An incision is made in the chest wall, often around the collarbone and the device is inserted. Using a-rays the wires that will conduct the electricity will be guided to the heart and the incision will be closed. Following this the computerised part of the device will be tested and programmed to the patients needs. The wound will be dressed and will be heal over time. The average life expectancy of the battery is around 7 years after which a new battery will need to be inserted. Again this will be performed under local anaesthetic.The patient and the device will need regular checks by both the doctor and a programmer. These checks are important for measuring the effectiveness of the device and to make sure the patient suffering no adverse effects. As the pacemaker is an electrical device, some consideration to your surroundings may be necessary. There seems to be no risk to the pacemaker or your health from the presence of almost all home appliances, but there have been reports of interferences with some types of security, telephone and surveillance equipment. Three are also many medical devices that cannot be used or should be used with caution in the presence of a pacemaker. Due to these reasons, it is recommended that an identification card or bracelet is worn, identifying the person as a pacemaker user and the type that is being used. Pacemakers are very important and useful pieces of equipment used in the treatment of cardiac arrhythmias. They can work continuously or on demand depending on the needs of the patient. Overall they are safe to use as long as the patient is informed of all considerations and informs the relevant people when needed. After having a pacemaker fitted as an emergency due to complete heart blockwhat would the expected follow up be?